LEET is a capture/replay tool based on the Windows Automation API. It can record interactions with many desktop applications – including surface-based applications running on Windows Vista or 7 – and replay them as regression tests. Additionally, existing tests can be used to generate rules – short invariants describing system behavior. The process of recording exploratory test sessions and enhancing them with rules – rule-based exploratory testing (R-BET) – is the subject of two publications, below. By using LEET in conjunction with an automated prototype – such as those created by ActiveStory Enhanced or SketchFlow – we can actually perform test-driven development of graphical user interfaces without giving up the advantages of a capture/replay tool. This technique is the subject of two further publications, below, and you can read more about it here. In the past year, LEET has been enhanced based on feedback from our industry partner – Pyxis – in order to increase usability and speed. LEET’s interface was significantly updated to make it easier to structure test suites in a way that makes them reusable and maintainable. Additionally, the speed with which actions are recorded automatically and the speed of the autocomplete functionality for manually creating tests have been significantly improved. With these improvements, LEET offers out-of-the-box support for GUI and acceptance testing that is rivaled by very few existing tools. 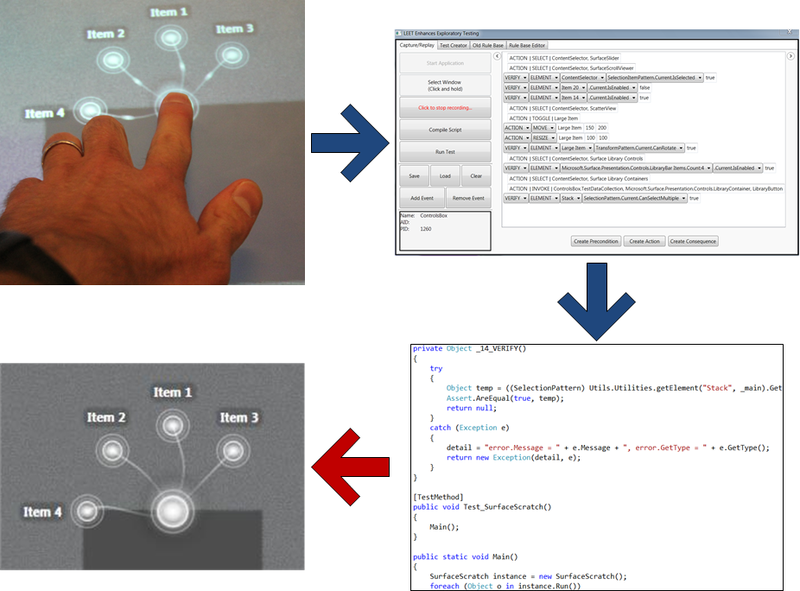 LEET supports the recording of the custom interactions and gestures common in surface-based applications. We achieved this functionality by making it easy to extend LEET to recognize custom gestures. See below for examples of how to get started with this. An introduction to usage of LEET. A diagram of UITDD. Clockwise, from upper left: interacting with a surface-based application; the interactions as recorded by LEET; the test script, compiled into executable C# code; replaying the interaction. To download LEET, click here to go to our project homepage on CodePlex. LEET is being used in development of the TableNOC application in conjunction with Ivrnet, Inc. TRLabs is providing funding for Theodore D. Hellmann in the form of an NSERC CRD Grant. Pyxis, Inc., provided support for Nadder Makhlouf’s internship as part of an NSERC Collaborative Research and Development Grant. This grant successfully concluded in 2012. Theodore D. Hellmann, Frank Maurer: Rule-Based Exploratory Testing of Graphical User Interfaces, Proceedings of the International Conference on Agile Methods in Software Development (Agile 2011), Salt Lake City, UT, 2011. Theodore D. Hellmann, Ali Hosseini-Khayat, Frank Maurer: Test-Driven Development of Graphical User Interfaces: A Pilot Evaluation, Proc. of 12th International Conference on Agile Processes and eXtreme Programming (XP 2011), Madrid, Spain, 2011. Theodore D. Hellmann, Ali Hosseini-Khayat, Frank Maurer: Supporting Test-Driven Development of Graphical User Interfaces Using Agile Interaction Design, In TDD 2010: International Workshop on Test-driven Development, 2010. Theodore D. Hellmann: Enhancing Exploratory Testing with Rule-Based Verification, M.Sc. Thesis, University of Calgary, Department of Computer Science, August 2010.